About Company : Bharti Airtel Limited is a leading global telecommunications company with operations in 20 countries across Asia and Africa. Headquartered in New Delhi, India, the company ranks amongst the top 4 mobile service providers globally in terms of subscribers. 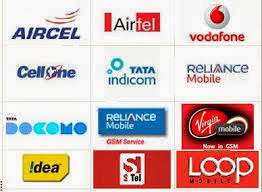 In India, the company's product offerings include 2G, 3G and 4G wireless services, mobile commerce, fixed line services, high speed DSL broadband, IPTV, DTH, enterprise services including national & international long distance services to carriers. In the rest of the geographies, it offers 2G, 3G wireless services and mobile commerce. Bharti Airtel had over 269 million customers across its operations at the end of March 2013. About Company : Reliance Group, an offshoot of the Group founded by Shri Dhirubhai H Ambani (1932-2002), ranks among India’s top three private sector business houses in terms of net worth. The group has business interests that range from telecommunications (Reliance Communications Limited) to financial services (Reliance Capital Ltd) and the generation and distribution of power (Reliance Infrastructure Limited). About Company : Vodafone is a leading global telecommunications company with operations in over 30 countries . Headquartered in London, the company ranks amongst the top 4 telecom companies globally in terms of subscribers and revenues. Company owns 45% of Verizon Wireless, the largest mobile telecom company in the US measured by subscribers. About Company : Idea Cellular is an Aditya Birla Group Company, India's first truly multinational corporation. Idea is a pan-India integrated GSM operator offering 2G and 3G services, and has its own NLD and ILD operations, and ISP license. With revenue in excess of $4 billion; revenue market share of nearly 15%; and subscriber base of over 121 million in FY 2013, Idea is India’s 3rd largest mobile operator. Idea ranks among the Top 10 country operators in the world with a traffic of over 1.5 billion minutes a day. About Company : Mahanagar Telephone Nigam Limited is an Indian state-owned telecommunications company headquartered in New Delhi. MTNL provides services in New Delhi and Mumbai in India and Mauritius in Africa. It was incorporated in the year 1986. About Company : Moscow, Russia – October 1, 2013 – Sistema JSFC (LSE: SSA), the largest publicly-traded diversified holding company in Russia and the CIS today announces that it has completed the acquisition of a 100% stake in LLC Bashneft-Services Assets from JSOC Bashneft for a total cash consideration of RUB 4.1 billion. The value of the stake is based upon an independent appraisal. About Company : Uninor is a young mobile operator in India. We are part of the Telenor Group, one of the world’s largest mobile telecom companies.